Bible Lesson: If God is Creator of all things, then He must be more powerful than anyone or anything. This is an important truth for children to learn at an early age. Because God is Creator, He is sovereign over all things including the problems and challenges that even children face. 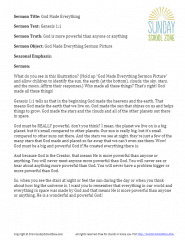 This free sermon download includes the sermon picture that illustrates the creation of the world, the sun and everything else.